The dynamics between dualistic and consensus political cultures. Can the child show that the Emperor is naked? At the coming climate summit in Copenhagen in December 2009 the present development model and its political system will come to an end. Faced with the core of its inner contradiction this system will break down when not only the heads of the political opposition will be present but also the more advanced bodies allied with a refusal of the separation of man and nature, bodies and heads. What will be left is an empty shell nobody more believes in unless they are paid to do so. The struggle will continue on all levels from our daily lives to world politics but there will be a system change or maybe we rather can talk about a cultural change that is also material. A turn that will change not only the power relations but also the way power is perceived and how we allow or reject it from dominating our lives and societies. How clear this break down will be is yet an open question, but the possibilities are there in front of us when we act together in our diversities strengthening each other. The legitimation behind the system of power within the present development model will break down faced with the accumulation of both environmental and social crisis by now recognized also by the main stream cultural ideology. Science is on the tipping point were the scientists no longer can ignore the environmental risks inherent in the present development model. And the scientists are the main legitimators of the present world order. For everyone to see the Emperor is naked as predicted by the Danish writer H C Andersen. The Emperor and his or her spin doctors and tailors of invisible legitimation is easy to identify. We know them when we see them whether he or she is the unassured right wing prime minister or equally empty handed competing environmental minister of Denmark or A P Møller, the owner of the shipping company and dominating Danish corporation Maersk who alone emits more green house gases than the whole of Denmark domestically. Or if it is the Nobel prize winner US president Obama himself. It might be harder to identify the child that tells us that the Emperor is naked. Once upon a time there was something called the press that were supposed to tell us these things. Now mass media are among the entourage of the Emperors spinning their story in common. According to them reality does not exist, only the competence of the unquestionably democratic politicians and their experts that together will manage to solve all the different crisis with the help of an ever-growing market. Under the banner of sustainable growth that will bring freedom and well-being as well as a better environment to our children these spin doctors claim that all violence is external to the present development model were all sooner or later are in a win-win situation. Violence is the result of ideological extremism opposing the invincible sustainable growth modernity. While the violence in this world thus are external to the system and if it anyway burst out are exceptions to the rule it is the opposite with any protests against the system. Here violence is inherent in any protests as it is designed by the media, parliamentary system, police and corporate public relations. Unless the opposition is not totally under control of the system and its separation of the bodies and the heads of the protesters. So who then is this child telling us that the Emperor is naked? Well this child is of course many children, maybe even a community of communities that together have the maturity of not only stating that the Emperor is naked but with their simple existence and presence acting together have a liveliness that makes the media flood light on the Emperor showing that he or she is actually a robot. In this article I will focus on the political opposition and how it is organized before, during and hopefully after the Copenhagen summit. I will address the situational context during the meeting in a first part as well as the historical background in a second part. It is my hope that this will contribute to both more understanding but also feeling of togetherness among all protesters in Copenhagen that are concerned about climate change. The main reason why there is a possibility for breaking down the legitimation of the present development model with its states and corporation in tight unity working together is the diversity of the mass activities that will take place in Copenhagen. Combined they will challenge the present holders of power on every level and every corner. To understand and get the feeling of why they can do it one can look at these activities from all angles, what they are, where and when they take place, why and how they are organised and who they involve. This will be addressed in both a more close and a wider context to make us feel and be aware of the change and possibilities that are there. How many will participate at these mass activities are not easy to guess. The organisers have stated different figures at different times, up to 150 000 in June for the December 12 demonstration. At present the guess for the mass demonstration is at the most 50 000 by the organisers, at least one can hope for tens of thousands. The mass action is estimated to get somewhere between 3 000 and 15 000 participants at early estimations by the organisers. The mass meeting hopes for 5 000 participants. The estimate for the forum is 15 000 in total and already in late October 5 000 had assigned as participants. For the mass meeting and the forum the number is limited by the localities, the forum will in total have many participants as the only mass activity that goes on for almost two weeks but the biggest hall allows only for 1 200 participants. Apart from the main mass activities there will be many other meetings, forums, actions, caravans arriving from afar and demonstrations, sometimes of considerable size and sometimes with a content that could make them more important than the main activities. Some of them will be mentioned under the different forms of activities below. The forum, called Klimaforum09 will start on December 7 and continue until December 18, probably also one or two days more to be able to respond to the outcome of COP15. It will take place in DGI-byen very close to the main station in the middle of the city. The mass demonstration will take place on December 12 from the town hall square – Rådhuspladsen – on the other side of the main station in the middle of the city to Bella Center to the South of the city centre on Global Day of Action initiated by Global Campaign on Climate, GCC. The mass action initiated by Climate Justice Action, CJA, on December 16 will have a similar route. The mass meeting with the heads of states from the ALBA countries in Latin America and the Caribbean on December 17 in the Valbyhallen, a bit to the West of the city centre. The four different mass activities use four different ways to involve the participants. Two are state-centric activities are both organised in a vertical way were the participants listen to a limited number of well-known speakers. In both cases they can contribute by responding to speeches creating an atmosphere of togetherness. But there is a big difference between the ways the public at the two mass activities are structured. At the mass meeting all are equally placed in the audience in a hall giving good possibilities for strengthening the feeling of unity. The selected speakers all have the same role in society as heads of states and have to a certain degree a like minded political ideology which further strengthens the emphasis on unity. In the demonstration the participants can be more active with their bodies but are structured in different blocs, each making their own statements based on a vague political platform. Thus the basic structure here is more like a market were each one can promote their message within a framework that is still basically vertical and to a large degree state-centric. But the market form gives larger room for competing messages from extreme admiration of world leaders and a way to participate that emphasis vertical forms and professionalism and little room for personal contribution to extreme anti-world-leader positions with an emphasis on horizontal forms and total room for personal contributions including confronting any authority that tries to stop this unfolding of personal expressions. So the two state centric mass activities both are built on vertical forms but in opposite ways, one promoting expression of unity with direct communication between leaders and the mass and one promoting expressions of branding different identities within a vertical market model. The funding of the two activities is basically different. The demonstration relies to a large extent on big NGOs which influences the way the messaging is designed. The mass meeting is basically funded by selling tickets to those participating and has thus a more horizontal way of funding the activity, actually the most horizontal of all mass activities. The two main movement building mass activities are both organized in a more horizontal way were the participants have more possibilities to contribute to the content and form of the activity. In both cases they can contribute to the result of the activity by intervening with their bodies or thoughts in relationships that can become more horizontal. But there is a big difference between the ways participant contributions are structured. At the forum and its preparations there is the possibility of contributing to both ideas and atmosphere by intervening in many details or the main message of the forum including the discussion of what to do afterwards. To a large degree the forum is also much structured as a market and many times the participants will be organized in the same way as in the demonstration within a vertical frame work. The mass meeting is even formally a part of the forum showing strong components of this mass activity that have tendencies towards these more vertical forms. But this is counteracted by the fact that the vertical market is balanced by a will to involve everyone in a declaration process both before and during the forum to make a common statement thus avoiding some of the worst market tendencies. It is also counterbalanced by the fact that there are many more practically oriented movements at the core of the organisation and thus one can hope that parts of the program put an emphasis on a wider range of questions were participants can contribute their own experiences on a more horizontal level than if more theoretical organisations were dominating. One can also hope that cultural expressions can influence some of the core of the forum to promote more horizontal relationships. The forum is by far the most costly of all mass activities and funded more or less entirely by the Danish government. Organisations in need of localities for their programme and participating individuals can do this for free. But the material realities poses some constrains on the forum strengthening hierarchic forms of power relations. The practical need of having a small professional staff might also create tensions between professional standards in today’s society and other values carried by more horizontal or democratic ways of organizing politically responsible work. The mass action structures contributions of the participants with more focus on their bodies and a more united message. But the way to contribute is more limited. Were the forum gives many ways to contribute both in details and the general message, with a lot wider type of scope in terms of addressing not only immediate concerns but also how to build a movement of movements the coming years, the mass action have a more clear focus on immediate goals. Economically the mass action seems strongly horizontal and independent in the way it is funded from many small sources. But this is partly questionable. The main legitimation for the action is participants from the South and these participants in many if not most cases depend on funding from governmental or NGO funds to come to Copenhagen. Anyway horizontalism in the mass action becomes a strong component in the way the activity is organized. And yet there is also here as with the forum some contradictory tendencies. At first glance this mass action seems to be an ideal horizontal kind of activity. But the consensus is built in advance and the decision made on the spot will be more problematic to take in horizontal manners due to time constrains. More important, the goal of the action can be interpreted in two potentially contradictory directions, both with vertical forms embedded in the choice of direction. One goal is to create a People’s Assembly with participants from both outside and inside that comes together inside or as close as possible of the Bella Center area, if possible crossing the police barriers, refusing to accept the division of outside and inside, and establishing an alliance for climate justice across borders. Here the disruption of COP is primarily the outcome of the political fact that official delegates walk out together with the presence of a mass of people giving room and relevance for such a Peoples assembly. But the official delegations are embedded in vertical relationships, especially governmental delegations. Thus the mass actions come in a similar position as the forum. The other potential main goal of the action is to physically disrupt the sessions by entering a far as possible from the outside as recently stated still as a possibility for the goal of the action if not for the masses but for smaller groups. Here another kind of vertical relationships becomes evident. The tendency that those activists that are willing to go further than others and take bigger risks are more valuable than the masses. If physical penetration becomes the main goal in practice there is the tendency that capabilities of use of the strongest or bravest physical means becomes the most important criteria and thus establishing a vertical difference between the participants. How far someone is willing and capable of physically disrupt the sessions becomes the main motivating factor rather than the combined goal of using both bodies for creating a space and bring a politically motivated assembly together. In the spring the tendency was making the people’s assembly the main goal, in the summer omnipotent ideas of disrupting COP for a whole day by entering from the outside became dominant and now there are more and more tendencies of putting a combination at the centre with the peoples assembly with participation from both outside and inside as most important. The tendencies to shift between two ways of looking at the mass activity that was evident also in the December 12 demonstration thus is also there in the December 16 action. Both movement building mass activities thus have uncertainties in the way the participants can become part of democratically strengthen the message and the force behind building a movement. To describe the main meaning of the different mass activities is of course to pretend that there is such a main meaning and thus to reduce the actual diversity. Especially when such generalisation is put in a wider context together with other generalising framing of the meaning of the course of events this is problematic. And yet it may be useful for understanding some of the dynamics that may occur between the different initiatives that maybe only together will give the momentum for building a stronger movement of movements for climate justice. With this limitation in mind I would say that the four mass activities have tendencies of being different not only in their form but also in the main focus of their content. The content can be partly understood by the names of the activities or the title of their main message, Klimaforum will launch a declaration with the preliminary title System Change – Not Climate Change, People’s First, Planet First is the title on the leaflet for the demonstration December 12, Push for Climate Justice the name of the action December 16 and ALBA a sustainable and solidarity alternative the title on the poster for the mass meeting. While the forum and the mass action have the main focus on movement building, the main focus of the mass demonstration and the mass meeting is more state-centric. The forum and the mass action puts the main emphasis on two sides of movement building, the forum on finding ways for a sustainable transition with movements as the main actor, the mass action on resistance also with the movements as main direct actors. The mass demonstration is diverse with a messaging that calls for putting pressure on politicians and some general demands which gives a wide room for many messages including such that goes in opposite directions. Thus the chosen form for the demonstration is much of a market where those groups that have the loudest voices or biggest resources can make their message seen more than the common platform. A market that ends at the official conference centre asking the politicians to come to results rather than inviting them out and join forces with a movement of movement for climate justice. The purpose of the mass meeting with the ALBA leaders is more to celebrate what the popular movements can achieve once the have gained some influence on governments. These considerations is the reason to place the different activities along a state-centric – movement building scale. There are of course some facts that points in another direction, e.g. has the Klimaforum to some degree activities that puts a strong emphasis on the expert role and it is unclear how much effort have been put into avoid promoting the role of political consumerism or strengthen movement building both in content and form. It is also so that political parties organise events at Klimaforum with speakers representing parties and not in their personal capacity. The mass meeting with the ALBA heads of states is also formally a part of the Klimaforum which only had to be placed elsewhere due to lack of sufficient big and cheap localities at DGI-byen. But the organisers of the mass meeting and political party activities have no central role in the Klimaforum and thus one can say that the main emphasis is in another direction. The mass activities have also been placed here along another axis from more local, practical or single issue oriented to more general, identity or ideological orientation. This axis can be seen as even more problematic than the other axis from state-centric to movement building. The forum can be seen by its nature as many single issue events put together but there is at the same time an effort to make a common declaration that goes way beyond single-issue politics. But the focus on practical and local concerns is there. The mass demonstration promotes much of single issue politics with its idea to let everyone have their own message within a broad framework which also gives some room for more system critical messages. The mass meeting brings by its nature the issues up to a more general and ideological level and can also be seen as a celebration of male national identity. The mass action has a clear general message for climate justice and as main initiators groups that puts an emphasis on anti-capitalism and thus the ideological message. The mass action is sometimes dualistically presented as a question of the needs of individual Western European activists to push as far as possible and the needs of the mass movements from the South for a peoples assembly, thus with a tendency of identity politics also here but in this case with both genders as prominent. Thus an ideal type of looking at the mass activities can claim in one corner practical and local movement builders, in another corner general or even global ideological movement builders, in a third corner a diversity of state-centric pressure groups for single issues and in the fourth corner general ideological state leaders themselves. The oldest initiative for any of the mass activiies in Copenhagen came from a meeting in Brazil held by Permaculture International in 2007. This was the origin of the Klimaforum09 which has few if any direct predecessors. In September 2008 some 50 activists mainly from Western Europe met in Copenhagen to start what became Climate Justice Action network. Non-violence civil disobedience actions as during the G8 Summit in Heiligendamm 2007 or the successful G13 action occupying the premises in the struggle for a new youth house on Copenhagen were inspirations leading to the Reclaim power action December 16. In December 2008 national climate campaign organisations in Denmark, Sweden, Belgium and the UK as well as Friends of the Earth Europe made the first call for a mass demonstration in Copenhagen December 12 on the global day of climate action 2009. The Iraq war mass demonstration have been promoted as a model for this activity. The mass meeting with ALBA leaders was initiated by the Danish Cuban Association in June 2009, the only of the mass activities with only Danish origin. We can be lucky in some aspects that the Climate Summit will take place in Denmark. The extreme competitiveness and isolation between and even within different groups in Danish civil society have caused an unprecedented dynamics which when combined with coherence among international popular movements can create a very strong force. The result of this competitiveness is that the four mass activities are organised by separate organisations. Over lapping is exception to the rule. Thus committed organisations are developing each mass activity according to its own internal dynamics. Organisations devoted to large scale broad demonstrations do their thing. Organisations interested in sharing experiences with others on both practical matters and more wider system critical cooperation get involved in organizing a forum. Organisations involved in supporting friendship between peoples and supporting progressive politics make the mass meeting and those committed to non-violence devote their energy into direct mass action. At the coordinating level there are six Danish organisation in the board of Klimaforum09 and one international, Permaculture International. 20 more Danish organisations are behind the initiative. There are five in the coordinating body of the December 16 demonstration and 79 more Danish organisations supporting the demonstration, a number that still is growing. There are four Danish members of Climate Justice Action and 18 Danish organisations behind the ALBA meeting. In the coordinating bodies there are no overlapping except for Climate Movement Denmark who is a member of both the Klimaforum board and the December 12 demonstration coordination group. Also when looking at the lists of those Danish organisations endorsing different activities are the examples of overlapping also very few. The political party Red Green Alliance seems to be the only organisation apart from Danish Cuban Association and International Forum, a radical solidarity organisation, that are involved in some way in three of the mass activities, the demo, forum and mass meeting. None is involved in all four. In total 111 Danish organisations are involved according to the official web sites of the four mass activities November 25. Out of these only 16 are involved in another mass activity by officially endorsing it. The Danish separatism has had interesting results. The movement building mass activities have a clear political system critical message, one with more focus on opposition against false solutions, the other promoting radical alternatives but both with platforms that complement each other when they do not overlap. The two more state-centric mass activities have a more politically vague message. The activities were political parties are more involved are thus less political than the activities dominated by movements activist. 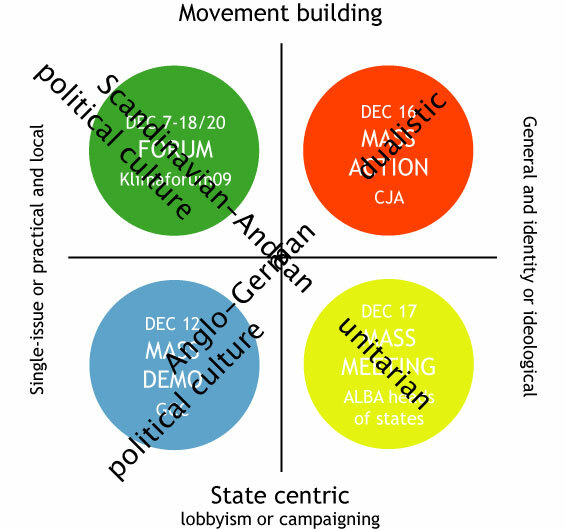 Movement orientation is more political, state centric less political. With a network that had organised most or all of the mass activities this political dynamism with movement builders in the role of politicizing political parties would not have occurred. The prize for the Danish dynamism built on a degree of separatism was not only isolation and sometimes polarisation between each other. The price was also separation from international possible cooperation partners and their experiences with the exception of Climate Justice Action. The Danish organisations involved in the mass action were on the other hand very few making them even more isolated from other Danish organisations than the other initiatives. Thus the dynamics here between the international and Danish level have been very hard to distinguish while on the other hand the tensions between Danish organisations involved in CJA and other Danish organisation that are not involved in this mass action have been rather intense. The mass meeting had the extreme opposite position. Behind the initiative were only Danish organisations. People’s Movement on Climate Change, an international network with similar positions as movements supporting the ALBA countries had until October not even any knowledge about the ALBA meeting as the contacts between the Danish organizations and like minded movements internationally was almost zero. The dynamics surrounding the mass demo have had its ups and down based on the political platform that gives wide possibilities for different interpretations. One can follow some of these changes by reading the minutes from mobilisation meetings on the www.12dec09.dk webpage. In one moment there is a stress on climate justice both as issues of social and global justice. Next time the main message on the front page of leaflets for the demonstration is trusting the world leaders who have a historic opportunity to save the world and the issue of social justice is completely forgotten not to talk about any change of the social system. What is left of global justice is put in such words that even some worlds leaders will agree and try to claim that this is what they are aiming at accomplishing. The shifts in the direction of the demonstration reflects the balance between groups with committed activists and groups with economic resources and few activists. Apart from the intentionally vague political platform the form of the demonstration is modelled according to the idea that each organisations or group of organisations have their own bloc. With this kind of market model in the bottom the two competing kind of groups, those with many committed activists and those with economic resources are struggling for branding their organisation or kind of identity as much as possible. Thus it has been reported that Oxfam could pay money for the demo and thus also influenced the content and the pink layout of a mobilizing leaflet and Greenpeace can pay the tribune in the end of the demonstration and maybe we all will be able to see if Greenpeace uses this for branding their logo. While these three mass activities have developed according to established patterns to a large degree building on earlier experience from mass civil disobedience at Summits, mass demonstrations on important global issues or mass meetings with political leaders the forum have had a much more tuff journey on its way to become reality. The original proposal from Permaculture International gained early support from many ecological organisations but very small. They came to the conclusion that they never would be able to organise such a big alternative summit without the help of big NGOs. Thus they approached them and asked about their interest. They all stated that they were not interested. The NGOs saw no point in organising an alternative summit as they had full access to the politicians anyway inside the official conference as lobbyists. So the ecological organizations including some small social movement with direct producers as peasants and firsherfolks continued on their own and sent their proposal also to the government. The government had more problems with how to respond to the idea. In contrast to the NGOs they had not lost the contact with political reality and understood that by saying no to funding an alternative summit for the civil society they would be easily accused of being against a legitimate concern. Alternative summits is a regular practice since the first UN Conference on environment in 1972 which has been a model for alternative summits at almost any kind of important summit in any field since then. More important people in common would not understand the argument that it is sufficient for everyone interested to become an official NGO delegate inside the negotiations and not give some in proportion small resources also for a meeting outside open to anyone. On the other hand were the proposal from the ecological groups very radical opposing false solutions as well as calling for a radical transition towards sustainability and social and global justice. So what to do? The answer was to avoid giving money to the radical alternative summit and instead give 20 million Danish crowns which is ca. 2,5 million euro to a selected group of NGOs and the ecological groups with the name People’s Climate Action letting the civil society decide for themselves what to do with the money. This would normally result in that radicals groups gets as usual a tiny proportion to maintain some democratic facade while most of the resources goes to supporting legitimation of the official process. Not so this time. What happened was that a fund was established an all could apply for money. The only serious proposal was still the radical alternative summit while NGOs chose to propose their own actions in the interest of branding their organisation. Thus the preliminary decision was to split the resources in two equal parts, one for diverse separate projects and one for the alternative summit while keeping quite some money also for an office for PCA. In this way the alternative summit received 1 million euro, NGO projects 1 million and the PCA administration 0,5 million euro. Now the big conflict started when the NGOs realised that much resources would be given to a civil society forum. The NGOs entered the scene and demanded influence on the forum. The radical ecological groups refused to change the original concept with a clear platform in opposition to the official agenda and with much of the resources given to participation from the South. This conflict was utterly sharp and delayed the possibility to have the final decision for receiving money until so late as June 2009 according to the original proposal. The NGOs had placed themselves totally outside the control of any serious mass forum to discuss climate change were people in common could participate while all the international popular movements working for climate justice with a strong base in the South were most welcome. This is a historical advancement that never before have been seen at an important environmental summit. The NGOs had finally shown themselves to be new governmental organisations rather than non-governmental organisations. Now in the last minutes preparations started. Interestingly the Danish initiators not only wanted to get rid of the NGO forum tradition ending in statements that rather than oppose the system legitimized it. They also opposed the left version of a more market oriented way of organising international gatherings, the social forum open space formula. Many of the organisations had been involved in organizing Denmark’s Social Forum and had the experience that this model was dominated by other political forces less interested in ecological issues, in the end resulted in passivity and lacked both political clear statements and linkage to mass action. Thus they chose to do the opposite by starting an ambitious declaration process with the intention to integrate all the discussions in different themes into a joint statement on 20 – 30 pages. This ambitious idea begun and emails were sent out. But the response did not bring in many of the central climate justice movement actors apart from Peoples Movement on Climate Change that is the only broad international actor that early on were active in both Climate Justice Action, the mass demonstration December 12 and Klimaforum. The Danes isolated themselves not knowing what to do at the same time as indirect conflicts emerged between organizations involved i the mass action December 16 and in the Klimaforum and December 12 demonstration. These conflicts were bound to come after the CJA decision in June to physically enter the official conference building from the outside to disrupt the sessions. Friends of the Earth Sweden tried to intervene in several ways by proposing that the People’s Assembly should be the main goal of the December 16 CJA action and to politically unite the main climate justice actors as Klimaforum, CJA, CJN and PMCC by proposing activities at Klimaforum building on the political platform of all these initiatives. The politically uniting initiative was well received and FoE Sweden asked to help with international contacts for the declaration process. At the same time FOEI and Via Campesina international approached Klimaforum and discussions started on how to widen the international role of Klimaforum. The result was that an international editing committee was established for the declaration process with half of the members from the South. The ambitions were already reduced to make a statement on 5 pages rather than five times as much. An advisory board was also set up for the Klimaforum with main climate justice movement cooperation partners. Thus a climate justice core have emerged at the centre of the combined mass activities untied by the international popular movements and their most closely related governments and NGOs. The mass movements with a strong global democratic base giving the South a decisive role in the political direction of the way organizations act have united their strength within Climate Justice Now. The strength of this network have been its coordination of criticising the official agenda and being inside the process rather than promoting alternatives and organising mass activities outside. Bu the key organisations within CJN have now been able to untie the dynamic but rather separate mass activities in a way that the Danish organizations were not capable of. Thus PMCC, FOEI and Via Campesina are in the advisory board of Klimaforum. CJN and CJA organises jointly a climate justice block in the December 12 demonstration were FOEI, Via Campesina, PMCC, Jubilee South and climate justice activists from the whole world will walk side by side. And CJA and CJN will organise the mass action on December 16 jointly to make room for a People’s Assembly with possible participants from both governmental and NGO delegates from the inside and masses from the outside. Among them governments that might also speak at the mass meeting on December 17. The mass activities that from the start became dynamic by being organised separately in a way that marginalised main stream NGOs as well as political parties is now integrated by global popular movements and some radical NGOs and progressive governmental allies in an unprecedented creative manner. The secret strength of the mass activities in Copenhagen is one further dynamic which comes from a capacity that goes beyond the dualism between government and civil society. What is expressed in the different activities are not only different ways social movements separate from governments or so called non-governmental organisations, NGOs, act in a coherent or contradictory way at Danish or international level. There is also a wider political cleavage that express itself, that between different political cultures. The Anglo-American political thinking that sees social movements and NGOs as separate from the state have problems in understanding how some civil society actors including NGOs can have positions more far from the demands made by the climate justice movement than some states. Also alliances across this Anglo-American division of politics are outside the framing of politics that this dualism tries to establish. Yes it is even so that in this world-view politics cannot be in singular, only in plural as a contract between different collective actors or individuals and not as one collective actor. A collective able of establishing a political culture that unites both political, economical and cultural dimensions in opposition to other political cultures including the possibility of over throwing the system as a whole. The English word for politics is even in its construction different from most other political cultures were the word for politics is in singular, politik, politiek, politica, etc. What is at play in Copenhagen is a dynamic between both dualistic and consensual political cultures expressed both through the mass activities and what is happening in the official process and among other established actors as corporations whether belonging to producers of goods or media and other services. As the mass activities are the main force to change politics in the interest of people in common a closer look at them is the first step in assessing what political cultures are at work, their strengths and weaknesses. When it comes to the outdoor activities the British political culture is dominant with some additional German influence when it comes to the mass action. More than any other political culture it is the British that sets the pace for climate activism and with vibrant energy have been a model for many other political cultures. This vibrant British political culture spreads its energy in all directions giving equal strength to both climate justice demands together with promotion of system change and on the other hand system friendly climate demands. This dualistic strength has especially influenced the mass demo stating People first, planet first. The German political culture has joined hands with the system critical part of British political culture behind the Reclaim power action December 16. Both the British and German political cultures have strong dualistic tendencies but in different ways. In the UK politics is perceived as the result of how pressure groups within different policy areas are influencing governmental decisions. To break out of this pattern in a more substantive way is very hard. On the other hand it is quite easy to get successes ideologically or in practical niches with local or market boundaries. When acting according to this pattern the state can be fairly soft. This produces at times very vital movements in both practical and theoretical expressions, but often short-lived. The tendency is also that the pattern creates a vitality that is more used for export to other countries rather than concentrating at changing basic social relations in the UK. As the pattern offers two diverging avenues it is especially fit to be both dynamic and capable of weakening a more profound popular movement that can challenge the dominant forces in all aspects of society. This was clearly expressed when the British political cultures hosted first European Social Forum in 2004 and then G8 protests in 2005. In the first case state centric forces among political parties to the left and trade unions focused on seperating antiwar issues from social change issues as UK parliamentary politics offered an at least rhetorical opportunistic moment for making opposition against the war the key political message. In the second case NGOs competing with each other on a market for fund-razing saw an opportunistic moment for separating the anti war issues from social issues and domestic social issues from international relationships creating poverty. In both cases a social movement strand able of integrating different conflicts and mobilising without getting trapped into state-centric of market forms was marginalised. The result in the first case was a full scale conflict within ESF including physical confrontation between what was labelled horizontals demanding that a wider range of issues should be addressed and so called verticals in control of the central organization selecting speakers for key events and making anti war issues the key demands. Two aspects that promoted top-down ways of working rather than activism. The result in the second case was promotion of rich celebrities as spokespersons for an anti poverty campaign who used their position to celebrate the G8 message by the British prime minister and other world leaders as historical successes contrary to the substance of the decisions made. The campaign organized according to the advice from professional expertise produced mass participation both in the UK and many other parts of the world but in the end rather passivity than activism. This time the British social movement tradition have been more able to avoid the two traps with the help of the climate camp movement equally putting emphasis on direct action and popular education. At the same time both the state-centric political party and the more market oriented NGO branding culture are equally dynamic within their own realms and sometimes in collaboration. A basic dualism is still there between on the one hand a movement built on horizontal or local activism and often consensus processes and the more top-down state- or market centric ways of working. This basic dualism among civil society actors reflects a larger dualism in the political culture between the state and the civil society. The British political culture which is partly open in both state-centric and market terms have been combined with another form of dualistic political culture, the German. Here the state is much harder to influence and the relationships between a movement and the state becomes easily polarised to the brink of complete confrontation. When nuclear waste is transported from France to Gorleben in central Germany up to 40 000 policemen can be needed to enable the transport to be carried out against mass civil disobedience in a scale far stronger than in any other European country. Some of this strength was shown at the G8 Summit in Heiligendamm 2007 when 10 000 participated in a non-violent direct action to bloc the delegates from coming in and out by land. While the British dualistic political culture could bring impetus to both the mass demo and the mass action in Copenhagen the dualistic German political culture have almost no influence on the mass demo but have been important for the mass action. The indoor mass activities are dominated to a large extent by quite the contrary kind of political cultures. The mass meeting is organised only by Danish organizations mainly belonging to leftist system-critical traditions the content is filled with Latin American progressive governmental politics. Of special importance are those presidents from states were an environmental concern and a climate justice politics is especially clearly stated such as Bolivia. In many ALBA countries popular movements have been strong and when progressive regimes are in place there is a tendency towards a consensus between the state and the movements. This is especially the case in Bolivia were the broadest popular movements are strongly related to the government. The forum is organised primarily by system-critical ecological groups and their allies among peasant and fisherfolks. Also here consensus traditions of the Scandinavian kind are strong. Scandinavian political cultures have equal tendencies as Bolivian towards consensus not only between popular movements and the state but in general in daily life and most social affairs. This is especially strong in Sweden and Norway while in Denmark sudden shifts can take place. From allowing local largely autonomous space as Christiania to violently cracking down on them as in the case of Ungdomshuset – The Youth House. From seeing even touching a policemen without any aggressive means as inherently violent to excepting very autonomous action when it is perceived as very local or matters of decency rather than politics. Here the cultural consensus at the national level is stronger while consensus in social and economic affairs is less so. Consensus is many times so important that if there is no consensus than there is no communication what so ever and everyone do their own thing. This causes competitiveness with on the one hand NGOs well integrated in the established political system and small but many local autonomous spaces or movements. One aspects of this is shown in the list of trade union endorsers of the December 12 demonstrations and the December 17 mass meeting. In both cases almost equal numbers of trade unions support the mass activities but there is no overlapping at all. Either you are part of the established organisations or you belong to a radical sector of some sort and the different radical sectors have little contact with each other. The international organisations sometimes intervened in a way not understanding the sensitiveness and possibilities of Scandinavian political culture. These problems became clear when mainly organizations in Sweden hosted the European Social Forum in Malmö close to Copenhagen. Organizations from the rest of Europe had a hard time to cope with the fact that Scandinavian organisations kept quite silent about their internal disputes in spite of that these conflicts were severe and put the whole organizing of the forum to the brink of practical collapse. This is due to the consensus culture of Scandinavia were people are supposed to stick together and do not speak up to much about problems but rather find common positions. This kind of political culture might be hard to understand for people from other traditions. This problem have this year repeated itself in maybe an even more problematic way in the relationships between Danish and organizations from other countries. Now not only in terms of conflicts between organisations but also within them and between national and international level and on issues that might have more serious political consequences. The problem is that the dualistic patterns in the British political culture as well as NGO diplomacy culture does not work in a Scandinavian consensual political culture reality. The strength of the dualistic British culture is that it creates two creative team building blocs each one developing its own inner dynamics but not as the Danish embedded in an overarching consensual culture also among most of the system critical groups. The British dualism ends up with seeing a need of not criticising each other. This makes it impossible to confront the identity politics that both more NGO oriented and more civil disobedience oriented groups tends to put a strong emphasis on. In one end branding the organisation becomes central and in the other end building the identity on being more physically and ideologically brave than others. Two foster principles that unites a whole movement of movements including also more consensus oriented political cultures is outside the scope of this British dualistic political culture. While being creative and producing much strength the weakness of the British political culture also in its fruitful stage is a dualism which stops the dynamics at this certain level. Especially controversial have the Reclaim power action at Bella Center December 16 been. Here the relationships between a fairly isolated group of Danish CJA organizations and other system-critical organizations in Denmark as well as other groups have been tense and dominated by the constrains of a consensus culture. International organisations have had problems in understanding the situation as there has been little outspoken criticism. There is also a NGO diplomacy culture that sees criticism of other organisations way of acting as inappropriate. Rather then openly criticise other tactics the focus is upon formally distancing oneself by seeing to that the name of the own organisation is not officially used to endorse any activity that is questionable. Furthermore international organisations know well that they have to be very cautious about intervening at the national level and have strong respect for the opinion of their members in the country were an activity takes place. The independence of national and many times also local level in international organisations is often strongly respected. But this was hard to show when the Danish organizations with the exception of the outspoken and provocative WWF kept quite. The fact that not one of the 18 Danish organisations behind the system-critical leftist mass meeting and only two or one of the 27 organizations behind system-critical ecological forum was part of the CJA seems to not have worried the international organisations. As CJA also informed incorrectly on their webpage about which organisations were behind the initiative and which ones were not and the representatives of Friends of the Earth Denmark shifted positions 180 degrees there was confusion. Thus there has been some drastic shifts in the way the December 16 action is presented. A strong focused on disrupting the sessions by entering from the outside remained for a long while a dominant message thus putting more emphasis on physical disruption than a peoples assembly. It remained at least at public meetings in Denmark in early November also after Climate Justice Now became a co-organiser of the action. But the criticism from some system-critical Danish organisation remained. The latest version of the call out for December 16 is drastically different and puts the people’s assembly as the main goal of the action while still promoting civil disobedience to overcome any barriers for making room for such an assembly bridging the gap between inside and outside. To many Danish organizations this might still be questionable but it will certainly also give much better arguments for the supporting it or at least good reasons for avoiding open criticism. What gives the popular movements strength at the climate summit in Copenhagen is the dynamics between mass activities that complement each other and the possibility for a dynamic relationship between Danish political culture and international intervention. With a consensus culture dominating the indoor mass activities and a dualistic culture dominating the outdoor mass activities there is a chance for a lasting convergence of forces that breaks out of the limitations of both political cultures. This possibility is helped by the expressions of the two opposite political cultures both in state-centric and movement building dimensions and more local, practical and single issue as well as in the more general, ideological and identity building dimension. Further strengthening the force is that both the domestic Danish culture has been able to express its greatest dynamic strength at the level of separate mass activities while the international or transnational political movement culture can contribute by establishing a strong climate justice block by the help of all forms of mass activities. Furthermore this bloc includes key actors also within the official process. On the one hand there is a well-articulated and coherently organized broad group of climate justice popular movements and NGOs inside the COP15 negotiations united by Climate Justice Now. There will be almost no detail in the negotiations that will not be scrutinized and immediately addressed in public from different angles. There is also sufficient coherence to bring forward a strong general assessment of the negotiation process all through the COP. The weakness from the mass protests at the G8 meeting in Heiligendamm in Germany 2007 with climate as the main official agenda and the protesters mainly addressing other issues will not be repeated. On the other hand there is also a stronger more confrontational group of oppressed countries from every third world continent and even maybe a whole united African continent at the negotiation table. A broad group more confrontational than there has been for a very long time in the UN. On top of that there is also a strong concern among many scientist that decisions will be far to weak. The normal way of portraying system critical protests as something going on outside and irrelevant to the agenda and scientific arguments is thus this time of less strength. Can the child show that Emperor is naked? What will make it possible for the moment when the public gets the Aha feeling seeing that the Emperor is naked. There are four roles in this scene. One is the public. Here we have two contradictory facts to take into consideration. Firstly that the public is already prepared for understanding that the Emperor is naked. In Denmark 90 percent of the population believes there will be no agreement in Copenhagen. In the rest of the world there is probably quite wide-spread understanding that the present politicians will not come to any effective action in spite of that there is a great problem. On the other hand the Danish public have little hope for any alternatives either and seems to see any attempts to state political facts by using the body in non-violent and disobedience ways is automatically violent. At the same time the present fossil fuel and corporate development model where Denmark is among the privileged is seen as inherently non-violent. In fact this model is very violent, causing oil wars and the forced dislocation of local communities all over the world. When those oppressed by this development model come to Copenhagen and bridge the separation between inside and outside the repressive force will have problems as the challenge comes from both sides, thus making it more of a political than police problem. A political problem that the public will have a lot harder to see in the light of police protecting those inside against illegitimate pressure from the outside. The other role is the tailor or with modern terms spin doctors and NGOs whose main goal is to be lobbyists. But to be able to create an image of the politicians producing effective political action, that Emperor really have clothes on, there has to be a lot admirers of this political action beautifully dressed. But if the admirers all have left the public and went inside the official negotiation to participate as accredited lobbyists there is no trustworthy audience outside that can tell people outside that the spin doctors and tailors all do a good job. What we see is really a nice piece of beautiful dress and effective action. The third role is the Emperor who has some problems with his politics and image. The climate crisis is not the only global crisis that has somewhat varnished his glancing image. The fourth role is the child. Why do we believe the child? It is present with its body in this world in dialogue with the surrounding environment, acting spontaneously rather than according to professional plans. 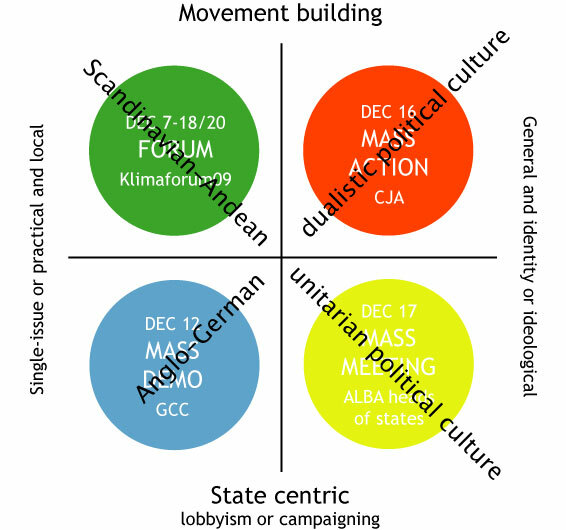 The four mass activities have enabled a connection of bodies and heads of a movement of movements. A combination also capable of taking parts of the Emperor’s entourage away from him making visible to all that there are alternatives built on global and social justice and were a movement of movements together with like minded governments starts to build another world here and now.